[0:36] <tdy> that's all the info you can get about it? a picture? [0:39] <ParkerR> UnaClocker, So plug in Pi catridge, it gets power, and hooks up to video and audio out? [0:42] <mgottschlag> actually, what about http://learn.adafruit.com/thermocouple/? [0:43] <qasd> so you can run python on the rasp i suppose? [0:44] <MrKeuner> mgottschlag, so assuming this is a thermocouple, it would not read me the temperature in a reliable way, correct? [0:44] <qasd> is there an hdmi interface on the rasp? i want to make a mediacenter. could i run a torrent client on the raspberry? [0:48] <plugwash> thermocouples need special electronics to amplify the very small signal they produce and to provide "cold junction compensation"
[0:57] <qasd> So what do I need to play around with a Pi? a keyboard and a TV is enough to have a computer? then i can progrAm on it and see it on the TV? it comes preinstalled with a linux distro? [0:57] <qasd> it is basically a 50 USD PC? [0:57] <mdszy> qasd, are you buying it with an SD card? [0:58] <mdszy> as in, an SD card specifically with an OS on it? [1:01] <UnaClocker> ParkerR: Sorry,went to fly a kite.. (Failed miserably).. Anyways, no, I was just noticing that it could fit in there..
[1:02] <pksato> reta: you using a same sd card? [1:04] <qasd> takes skill to get a disttro onto an SD card? there a re ready for SD card downloads i suppoose? [1:07] <SpeedEvil> I was wondering about the plausibility of making vacuum insulated pipe. [1:22] <qasd> can you make a cheaper mediacenter with a raspberry than it costs to buy one equally powerful? [1:24] <pksato> qasd: mk802 Android 4.0 media player cost arround 70USD. [1:33] <ldionmarcil> qasd: define "put what I want on it"
[1:55] <timmmaaaayyy> i want to mount a drive from my qnap....it supports nfs, smb, afp, or pretty much everything else as well. what's the easiest? any ideas? [1:57] <timmmaaaayyy> if nfs builtin or do i have to install stuff? [1:58] <pksato> smb is more resource intensive. [2:00] <pksato> ah... some wrong. [2:01] <pksato> no. is correct. [2:04] <Osile> do you know how to change your keyboard layout ? [2:06] <Osile> yes but if did that and reboot my keyboard is still in the wrong layout..
[2:07] <pksato> Osile: root is mounted as read only? [2:07] <Osile> how could i check this ? [2:08] <pksato> or, sd write lock . [2:20] <Osile> what meens df -h ? [2:21] <Osile> ehm it says that i have 2.9 gb total but i have a 16gb sd ?? [2:21] <pksato> timmmaaaayyy: yes. can do. [2:21] <timmmaaaayyy> pksato: sweet! any idea how? [2:22] <Osile> nope no idea..
[2:22] <pksato> ah? it not work? [2:23] <pksato> Ah... you need do delete non empty directory. [2:27] <pksato> or, first delete files. [2:52] <Osile> do you have any idea because of what if i copy a img (size 4 gb) to my 16gb sd this reduce the total space to 4 gb ? [2:57] <plugwash> so when you write it to the card the partitions will only occupy a small part of the card. You can enlarge them with partition editing software like gparted. Some images also come with tools to enlarge the partition on the Pi itself. [3:04] <Ademan-remote> Is it possible to create an opengl context without a display connected? [3:53] <Viper-7> how is that a bad thing? [4:07] <xiambax> Anyone here live in Palo Alto? [4:23] <DaxxRuckus> "SyntaxError: Non-ASCII character '\xc2'"
[4:24] <DaxxRuckus> what does that mean? [4:24] <xiambax> What key did you press? [4:25] <steve_rox> has cam module been released or has this news website screwed up? [4:26] <pksato> Not on sale. [4:33] <pksato> but, model A is on sale on EU. [4:35] <pksato> pre-production camera module and sales of model A are announced together. It can make confusion. [4:36] <Tater61757> I wouldn't buy the first run of cameras anyway. let it go for about two months, then make a purchase. [4:43] <Tater61757> why remove it? 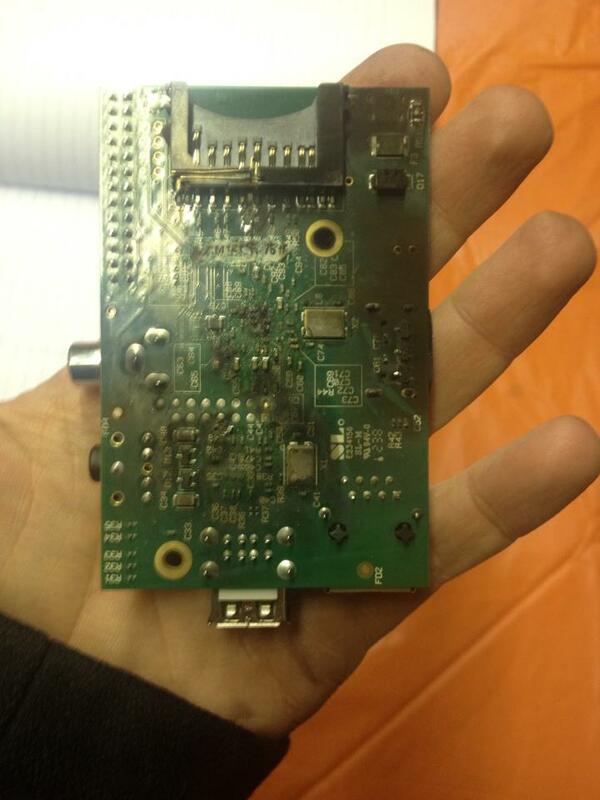 [4:45] <steve_rox> did you see that pi pic which had been allmost vaporised by 150v? [4:45] <Tater61757> steve, nope, got a link? [5:10] <xiambax> Do you think there will be a second digital revolution? [5:14] <ShiftPlusOne> I think that if there is, it will be in the lab, not in garages. [5:15] <mdszy> I think it'd have something to do with totally redefining the internet, something that would definitely keep it out of the hands of gov'ts that want to control it. [5:17] <ShiftPlusOne> Heh, same here. I had that thought while reading iWoz. [5:19] <ShiftPlusOne> I've recently bought myself a C64 and cleaned it up. https://dl.dropbox.com/u/175702/C64_clean.jpg It has been quite interesting to learn about and mess around with. [5:23] <ShiftPlusOne> I disagree with the whole 'missing something' idea though. There's nothing back then that you can't do now. You can design your own cpu or gpu on an fpga, start modding old hardware and extending its capability and so on. Then there are heaps of open source projects you can contribute to. 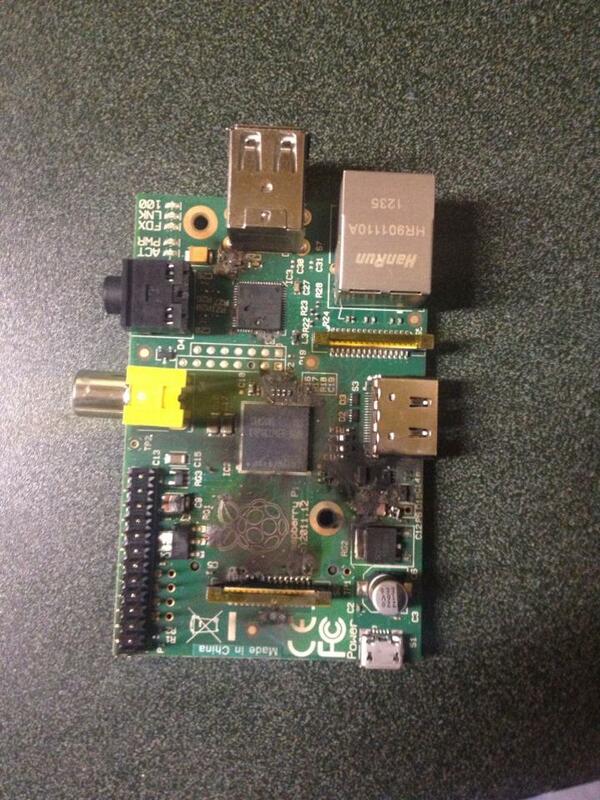 Even things like raspberry pi open up many possibilities. [5:23] <SpeedEvil> my oldest working system is a Cambridge z88 portable computer. [5:24] <SpeedEvil> as to things you can't do. [5:26] <SpeedEvil> this is basically impossible with todays systems. [5:26] <xiambax> I want to start a computer company. [5:27] <ShiftPlusOne> Sure, but you couldn't learn the whole of todays systems back then either. Old hardware is still fun to learn about, despite having insanely complicated modern alternatives. [6:35] <mukti> Is there anyway I should cool it? [6:36] <Eartaker> add a heat sync? [6:38] <mukti> I was considering a heatsink, but I don't know how much that would help. Have you used them before? [6:42] <ShiftPlusOne> heatsinks are pointless, stop being silly, people. [6:43] <ShiftPlusOne> Check the actual reported temperature if you're concerned. If it's under 80c (and it is), then you have nothing to worry about. [6:46] <mukti> What do you use to check temperature, LM_sensors? [6:53] <mukti> Is vcgencmd included in most Linux distros, or is it just a raspberry pi thing? [7:13] <UnaClocker> The "multiplexed" buttons are funky..
[7:14] <UnaClocker> Not bad for a model B.. You swap in a better voltage regulator? [7:15] <steve_rox> wernt you that guy that ripped the lan chip off? [7:15] <steve_rox> hows that working out? [7:16] <steve_rox> makes ya wish they dident discontinue the lapdock eh? [7:16] <UnaClocker> No more RCA jack (composite), audio jack, and ethernet jack..
[7:16] <UnaClocker> You can still get the lapdock for like $77 on Amazon in the US..
[7:17] <steve_rox> anyone figure out the battery capasity in the lapdock yet? [7:17] <UnaClocker> Yeah, if Apple had a flop like the lapdock, the anti-fanboi's would be having a field day, but since it's just one of the thousand android's, nobody's laughing.. heh..
[7:18] <UnaClocker> steve_rox: It's a custom flat lipo, much like the one in a macbook air.. It doesn't have any markings from what I've seen in some teardowns. [7:18] <ParkerR> steve_rox, "Battery: 36Wh 3 cell"
[7:19] <UnaClocker> And don't try to power a Boeing nightmareliner with it. [7:20] <UnaClocker> Seems like more of a nightmare than a dream, to me..
[7:22] <UnaClocker> Yup, I'm right there with you..
[7:22] <steve_rox> now you have a long power portable pi , what do ya do with it? [7:22] <UnaClocker> Love the battery life..
[7:24] <UnaClocker> Took mine to the local hackerspace last weekend.. Did some Arduino coding on it..
[7:26] <UnaClocker> I just used whatever that icon is in X.. Works well..
[7:27] <ParkerR> UnaClocker, Every time I hold this lapdock in my hands I just think to myself "Such amazing build quality for so cheap"
[7:28] <UnaClocker> ParkerR: Yeah, I'm spoiled by my MacBook Air.. It's about the same..
[7:28] <UnaClocker> Granted, yes, $40 is alot better than the $700 I paid for the air..
[7:28] <UnaClocker> Or, $110 when you factor in the pi, SD card, adapter cables and wifi adapter..
[7:29] <UnaClocker> steve_rox: I use cat5 whenever possible.. Both my XBMC Pi's are hardwired..
[7:31] <ParkerR> UnaClocker, Did you ever find a way to get it to not power cycle when closing? [7:32] <UnaClocker> ParkerR: No, I haven't gotten back into that.. I suspect there's a mosfet on the motherboard that's triggered by a magnetic switch.. If I can identify the mosfet, I can just jumper around it. [7:32] <UnaClocker> I failed to find the switch in my previous attempt. [7:33] <UnaClocker> Yeah, I didn't want to get that deep into this thing. [7:33] <UnaClocker> I'm pretty sure it's in the palm rest, or above the screen. [7:34] <UnaClocker> heh, doesn't hurt them at all. [7:34] <UnaClocker> ParkerR: Yeah, it's got brightness icons.. :) Shame the volume doesn't work. [7:35] <UnaClocker> Yeah, I've not only had magnets near HDD's, I've had alternating magnetic fields near them (water pump in a water cooled computer) with no problems. [7:35] <UnaClocker> Not to mention the screen really washes out if you go all the way up..
[7:36] <UnaClocker> steve_rox: I take it you've never used an iPad2 or later..
[7:36] <UnaClocker> heh, and hence why you're living in the dark..
[7:40] <UnaClocker> Screen or armrest? [7:41] <UnaClocker> Ok.. So either get to it and disable it, find where it's wires lead and disable them, or remove the magnet from the screen. [7:41] <UnaClocker> I suspect the screen is glued together, like an MBA..
[7:42] <mukti> Does anyone know what could call this? [7:42] <UnaClocker> No VNC experience, myself. [7:44] <ParkerR> "<UnaClocker> I suspect the screen is glued together, like an MBA.." Only one way to find out. [7:49] <UnaClocker> Ahh.. But will it go back together without new glue? [7:49] <UnaClocker> Well, after you find that pesky magnet. [7:51] <UnaClocker> I'm still trying to get this Sega controller to work..
[7:52] <steve_rox> i asume you mean messing with the originals? [7:53] <steve_rox> can you put commers in domain names? [7:53] <UnaClocker> Ahh, that's why it wouldn't let me click it..
[7:54] <UnaClocker> ParkerR: Don't go cracking your LCD. That'll make me sad. [7:56] <UnaClocker> ParkerR: They use heat guns (the very temp controlled SMD soldering kind) to get the glue to release on the MBA's..
[7:58] <UnaClocker> steve_rox: Some strange desire to make them smaller.. Me, I'd rather my iPhone 5 be as big as the original, with like 7 days of 4G battery life..
[8:01] <UnaClocker> ParkerR: that's the magnet you need to remove, has nothing to do with holding it closed. [8:12] <UnaClocker> On a side note, my 11 year old son beat Quake 3 today.. ;) heh..
[8:13] <mukti> Is there an fstab in archlinux arm for the pi? [8:15] <UnaClocker> Problem solved, out like a bad tooth. [8:20] <UnaClocker> Sure beats the supercap I saw some people using..
[8:22] <UnaClocker> Woulda really sucked to crack the screen. [8:29] <UnaClocker> hehe, glad to help, now I know how to fix mine too. [8:32] <UnaClocker> Mmm, I hadn't noticed..
[8:45] <UnaClocker> Just have to adapt it to the teensy's USB keyboard control. [9:05] <mukti> Anyone know how to set the time/timezone on arch for the rasppi? [9:20] <Twist-> Is there a good answer for the "no ARM dropbox client" problem yet? [10:45] <dwatkins> I'm tempted to get another Model B now they have more RAM. [10:48] <dwatkins> where did the driver come from, _21h_? [10:50] <dwatkins> why do the values need to change? [10:58] <mgottschlag> that should give you information about things like "how do I set pin 25 to HIGH?" [11:04] <Serano> would I be able to display 4 videos/pictures/... on a raspberry pi with tmux/byobu/screen solution? [11:04] <Zhaofeng_Li> does tmux support rpi's gpu? [11:05] <ShiftPlusOne> Does tmux use the gpu in any way that the console doesn't? [11:19] <ShiftPlusOne> tmux is not special in any way when it comes to the gpu AFAIK. It doesn't need to use it directly and it doesn't need GPU acceleration. [11:21] <dwatkins> Isn't tmux entirely text-based, or can it support console graphics as well? [11:24] <Xark> dwatkins: I agree, text based AFAIK. [11:25] <dwatkins> Serano: I don't believe you can display images nor video in GNU Screen except as ASCII. [11:25] <dwatkins> If it's just images, how about a [refreshing] webpage? [11:35] <gordonDrogon> What Ho Pi Peeps! [11:38] <aDro> You can apparently download it very easily. [11:38] <dwatkins> The angry looking ram at the top corner is my favourite part. [11:40] <dwatkins> It has resulted in some useful passwords, however. [11:42] <dwatkins> bah, libcurl3-gnutls is a required package for fbi but fails to download on raspbian. [12:05] <gordonDrogon> dddh, why? easier to make one out of an arduino. [12:15] <gordonDrogon> dddh, big issue with the Pi is lack of proper real-time control. [12:15] <gordonDrogon> dwatkins, ah ok.
[12:18] <jacekowski> i was just wondering, HDMI path on rpi is only one way, not reversible? [12:18] <gordonDrogon> _21h_, oddly enough I have one of those on my desk right now in a module with a battery..
[12:19] <_21h_> its a GPIO23, 24 and 25. right? [12:20] <gordonDrogon> yes. physical pins 16, 18 and 22 -> BCM_GPIOs 23, 24 and 25. [12:20] <gordonDrogon> did you get a module or build it yourself? [12:25] <gordonDrogon> nothing untowarsd there. [12:26] <gordonDrogon> without that the program will crash. [12:27] <gordonDrogon> I'm surprised it's not crashing at the very first pinMode() call. [12:27] <gordonDrogon> _21h_, ok - what setup are you using - wiringPiSetup() or wiringPiSetupGpio() ? [12:28] <gordonDrogon> You are using the native wiring Pi pin number with that - in this case they would be: 4, 5 and 6 respectively. [12:29] <gordonDrogon> Maybe I should get mine going now..
[12:39] <gordonDrogon> you need to understand the relationship between the pin numbering and the 2 ways to initialise wiringPi. [12:39] <gordonDrogon> study the diagram. [12:41] <gordonDrogon> there is a set of "helper" function in wiringPi for I2C now. [12:42] <gordonDrogon> Nothing more than wrappers round what the standard kernel gives you, but they're functional. [12:44] <gordonDrogon> at the kernel level? [12:44] <gordonDrogon> only if people use your kernel though. [12:45] <gordonDrogon> and I know that 'traditionally' kernel drivers are arguably the way to do it, however more and more people are connecting up more and more weird things to the Pi at the user-land level. [12:45] <gordonDrogon> so treating it like a microcontroller with a posh OS, really. [12:46] <gordonDrogon> yes - not always for the better, however I can't see it changing for a while. [12:47] <gordonDrogon> thought there already was a Pi "shield" with a full arduino on it? [12:50] <gordonDrogon> have you programmed the fuses in a 328p yet? [12:50] <gordonDrogon> on the internal clock. [12:50] <gordonDrogon> you can do it directly from the Pi. [12:51] <gordonDrogon> it has an internal 8MHz clock and the divider defaults to 8 -> 1MHz clock. [12:52] <treeherder> should i use a resonator for that? [12:53] <gordonDrogon> your choice... personally I'd live with 8MHz if you can - then no clock and you gain 2 IO pins..
[12:53] <treeherder> without a programmer? [12:53] <treeherder> only with the pi? [12:55] <gordonDrogon> but yes, you can use the Pi as programmer, and use it to set the fuses too. [12:55] <gordonDrogon> you just need 4 wires to the GPIO connectors, power + 0v. [12:56] <gordonDrogon> and my patched version of avrdude and setup scripts. 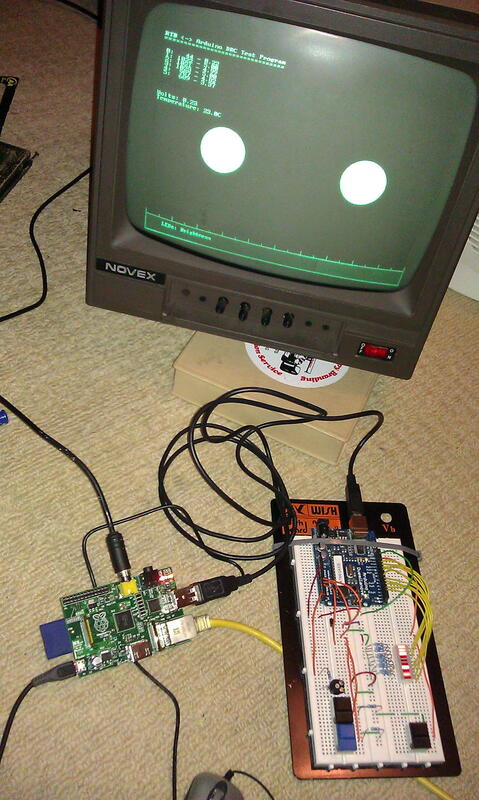 [12:56] <gordonDrogon> just follow through the stuff on gertboard on my site - the gertboard has an ATmega328p at 12MHz. [12:56] <gordonDrogon> read the manual to get the right fuse values though. [12:57] <gordonDrogon> actually no - that version of avrdude doesn't use it - it uses the /sys/class method. [12:57] <gordonDrogon> so it's slow, but it works. [12:57] <treeherder> by "read the manual" you mean? the 328p datasheet? [13:08] <gordonDrogon> dwatkins, highly likely. [13:09] <gordonDrogon> Viper-7, there are plenty of gluten free breads now. [13:09] <gordonDrogon> don't go to McD's then! [13:10] <gordonDrogon> I am an advocate of home cooking - and I'm happy to go to a real butchers for my meat too. [13:11] <gordonDrogon> In my life I have visited a McD's twice. once was over 30 years ago when I had a burger just to see what the fuss was about and once was a couple of years ago when I had a coffee - which wan't too bad. [13:12] <gordonDrogon> and organics too. [13:14] <gordonDrogon> I'll find out how well it makes scones in a few days. [13:15] <gordonDrogon> well that was nice. home made bread and butter :) One small loaf to last me the whole week until I make another next weekend. [13:22] <gordonDrogon> isn't there "pot rice" now? [13:25] <Viper-7> now im hungry. [13:29] <treeherder> i just hook it up to pins 11-13 on the 328? [13:31] <gordonDrogon> I think so - I'd need to check the actual pins, but it's probably right. [13:48] <dangerousdave> anyone know how to set control for minecraft pi eddition? [13:49] <gordonDrogon> treeherder, I forget - would need to look it up. [13:50] <gordonDrogon> _21h_, where does it segfault? [13:50] <gordonDrogon> _21h_, howevre regardless, I'd suggest not naming your own function read() - call it something else - read() is a fairly important system call. [13:50] <gordonDrogon> _21h_, compile with -Wall too. [13:54] <gordonDrogon> the tobin() function is missing and the declaration of char t = "" ; is somewhat suspicious. [13:57] <_21h_> gordonDrogon: segfault vanished, but ds1302 not reads. do you have sample code for 1302? [13:59] <Osile> have anyone a idea how to change my keyboard layout ? [13:59] <gordonDrogon> _21h_, no - while I have one on my desk, I've not written code for it. [14:00] * gordonDrogon ponders... How bored am I this afternoon..
[14:02] <regen> i can write my precious ??, ? ?, ?? [14:04] <gordonDrogon> ok. I have connected my ds1302 up to a Pi - bear with me. [14:21] <regen> anyone tried to use gdb to debug your sdl apps? Anyone not having to restart your pi by pulling the power after that? [14:56] <ryanteck> Anyone here got a cool Raspberry Pi project? Need a few for my site I'm launching next week. [14:59] <regen> the plans are vert undefined right now, im still doing the really basic things. But hopefully theres a webcam that cen see the monn AND the planets? [15:07] <regen> also, me and a colluege have a compition, first one to get the raspberry around our office build by itself wins. [15:14] <ewanmd> can't get a silicon labs cp210x usb-serial convertor working, shows up in dmesg though, any ideas? [15:20] <ewanmd> wh1p, may be of no use but think adafruit do a modified version with more io access and much smaller image. [15:21] <wh1p> anyone on here aware of a good script that is only available for removing all the bloat from raspian? [15:40] <megaproxy> for a basic page. [15:40] <wh1p> what are you doing with sql that uses 1gb ram? [16:01] <kelm> anybody know what is the maximum supported level for x264 on the rpi? [16:02] <kelm> level 4.0 its ok but what is the max supported? [16:03] <bennypr0fane> megaproxy dodgy meaning what exactly? [16:03] <megaproxy> meaning not working? [16:03] <jacekowski> bennypr0fane: is it overclocked? [16:05] <bennypr0fane> my power supply is 1,2A, ordered from RScomponents together with the rpi. anyone have the same? [16:05] <kelm> bennypr0fane: i search the max supported by raspberry pi hardware , you have an idea? [16:06] <_21h_> gordonDrogon: can you share your code? [16:13] <bennypr0fane> what kind of power supplies do you guys use? anyone below 0,7A? [16:13] <kelm> and if you clone your card in an other one (with dd per exemple) do you have the same prb? [16:16] <bennypr0fane> big new one with Android? [16:20] <bennypr0fane> jacekowski yeah, and when you put a different OS on that card? you just slap label over sticky label on it? [16:22] <gordonDrogon> _21h_, I'll publish it once I'm happy it's working - it's not working right now. [16:24] <bennypr0fane> chod you tried Riscos? I read the description, sounds neat! what you use it for? [16:24] <bennypr0fane> on which devices, before the Pi? [16:27] <chod> too many keyboards here typos etc. [16:33] <bennypr0fane> which seems an acceptable amount of effort for the benefit of not needing to clutter my desk with 2screens, keybd and mice. [16:39] <Eliatrope> how are those sockets/connectors with a lock for flex cable called, like the camera socket on Raspberry Pi? [16:39] <Eliatrope> can they be purchased in normal shops? [16:43] <vis> oops. connection tripped out after I fiddled with the router. Is 6meg connection expected? [16:57] <mjr> you should get rather higher (though are you sure you don't mean you're getting 6 mega_bytes_ per sec? [17:10] <applegekko> hey guys when yo usudo halt, is the pi ment to start back up? [17:12] <applegekko> is there like a switch on the pi or something i i have to press? [17:19] <regen> hi! I have edited my /etc/sudoers file in some bad way and now sudo is broken=/ I tried to hold shift while restarting to get into recoverymode but nothing happend. What to do? [17:21] <regen> Im not very good at linux, i have been runing as the default pi user now for a while. how do i even login as root? [17:21] <regen> is it this sudo -i ? [17:21] <Amadiro> regen, at the login prompt, you can type "root"
[17:22] <regen> can i do that in raspi-config? [17:23] <Amadiro> chod, that's pretty much all you can get. You have to pull the power plug if you want to make everything completely powerless. [17:24] <chod> on riscos it wont go off. [17:24] <regen> popping the sd cart it is then, thanks! [17:25] <Amadiro> does riscos even have a command line? [17:43] <andoma> i've got some dispman elements that does not cover the full screen, thus the normal framebuffer console is still visible. What's the best way to get rid of that? [18:23] <cdan> anybody using an A13-OLINUXINO ? I am interested on how does it compare to RaspberryPi. [18:41] <gordonDrogon> _21h_, The good news is that I can now read the clock without any glitches. it's a bit of a funny one, but using my existing shiftIn/Out code won't work that well with it..
[18:46] <Hodapp> whoa. someone else actually tried to build my Raspberry Pi project to control ShiftBrites! [18:47] <gordonDrogon> _21h_, however, do check the pins in hte setup - I'm using different ones to you. [18:47] <gordonDrogon> I'll turn this into a proper wiringPi library shortly. [18:48] <gordonDrogon> or I might just leave it as a stand-alone program..
[18:48] <Hodapp> I am a bug magnet. [18:53] <gordonDrogon> _21h_, if you run that it should dump a memory test of the RAM then read the RTB registers. [18:53] <gordonDrogon> er, RTC register. [18:53] <gordonDrogon> Hodapp, what's the project? [18:56] <gordonDrogon> Hodapp, got a link to a data sheet on those? [18:57] <gordonDrogon> http://www.coolcomponents.co.uk/catalog/shiftbrite-p-827.html <- these? [19:00] <gordonDrogon> pretty straightforwards. you should have trouble with those. [19:00] <gordonDrogon> it's fairly standard SPI. [19:01] <Hodapp> yeah, except I've done it, and it's not. [19:01] <Hodapp> can't use spidev. [19:02] <gordonDrogon> at least looking at the data sheet, I can't see why not ..
[19:02] <Hodapp> you need a separate latch line you have to be able to control alongside the data lines. [19:02] <gordonDrogon> that's the CE line. [19:03] <gordonDrogon> when you write to the SPI, CE goes low, then the clock wiggles and data is clocked out, then the CE gies high - at that point the chip latches the data to the LED driver. [19:03] <Hodapp> and I get only indirect control over CE. [19:04] <gordonDrogon> you don't want/need to control it - the spidev driver does it for you. [19:04] <cdan> I am looking for a good, 4.3'' - 7'' LCD + touch solution for RPI. Any advice ? [19:05] <gordonDrogon> Hodapp, how many LEDs do you have? [19:06] <Hodapp> gordonDrogon: I looked at it on a scope. spidev was most definitely not doing the needed pattern. [19:06] <cdan> SpeedEvil, then what's the need for a RaspberryPi ? [19:10] <Hodapp> gordonDrogon: spidev in Linux sets CE0 and CE1 based on whether I write to /dev/spidev0.0 and /dev/spidev0.1. [19:10] <gordonDrogon> Hodapp, ok. So I guess it's working ok with MMC's bit-banged driver then? [19:10] <gordonDrogon> Hodapp, yes, that's right. [19:11] <gordonDrogon> they're normally high when a device is opened. [19:11] <gordonDrogon> they go low when you start a write, stay low while the write is clocked out (N bytes) then go high again. [19:11] <Hodapp> gordonDrogon: so when I need to drive the latch low before the next clock pulse, I don't really have a way to do that. [19:12] <gordonDrogon> Hodapp, from my reading on the data sheed, you need to keep it high for each 32-bit write sequence per LED. So if you have 10 LEDs then it stays low for 10 * 32 bits = 40 bytes. [19:12] <gordonDrogon> and that's what will happen if you do a 40 byte write. [19:12] <gordonDrogon> I currently have a device I'm doing a 80KB write to in a single operation and it's working perfectly. [19:13] <Hodapp> gordonDrogon: Is that device a ShiftBrite? [19:13] <gordonDrogon> no, but it is a bunch of LEDs. [19:15] <Hodapp> gordonDrogon: I examined it on a scope. I wasn't bringing the latch low before the clock pulse. [19:15] <gordonDrogon> so if you write (fd, buf, 4); where buf is 4 bytes repretesnting the 3 x 10-bit values it ought to do it to the first LED in the chain. [19:30] <gordonDrogon> floppy drive camera? [19:36] <gordonDrogon> Hodapp, Did you actually try it with the spidev driver? [19:45] <ikonia> I've got the revision B pi, I'm considering making it a retro emmulator box, eg: mame, zsnes, etc. I'm curious if other users have used it for emmulator style functions ? [20:41] <hyppias> I am trying to install apache2 with perl module, but aptitude keeps saying it cannot find libperl5.14_5.14.2-16+rpil_armhf.deb. what is going on here in raspian? [20:53] <pa1983> any one managed to compile omxplayer recently? [20:57] <ikonia> I'm trying to get / set my TV to a sane 720p mode. [20:58] <martk100> When I exit xbmc I have to press ctrl-alt-F7 followed by alt-right to get back to my desktop. As I plan to eventually run without mouse or kb (touchscreen only). Can I add the keystrokes to a script. If so which one. [21:00] <ParkerR> Or for a quicker print out " edidparser edid.dat | grep best "
[21:03] <ikonia> ParkerR: so if I set it to mode 4 it should go to that resolution ? [21:03] <ParkerR> "<ikonia> as I understand it from reading, I've set the hdmi_mode=4 in the /boot/config.txt"
[21:04] <ParkerR> ikonia, Wait do you have hdmi_group set anywhere in config.txt? [21:05] <ikonia> I wasn't %100 clear on the hdmi_group function. [21:16] <regen> Anyone know why i need to run my sdl app as sudo, otherwise i get a segmentation fault? [21:18] <scummos> run it through gdb and see what happens! [21:18] <scummos> that's because... what? [21:20] <regen> i dont know what to do more then compile with -g and then start gdb and run my app? [21:21] <scummos> what exactly happens, can you describe in more detail? [21:24] <scummos> are you doing this on the pi? [21:25] <scummos> did you try doing the same on your desktop computer, on x86? [21:27] <regen> thanks a LOT btw! [21:28] <regen> should be noted that i run it without any arguments now, so now gpio etc. [21:30] <regen> doesnt makefiles work either way? [21:32] <regen> what why how? [21:33] <regen> but thanks for checking! [21:37] <regen> so i guess i should check for the last one? [21:37] <regen> where it failed? [21:40] <regen> hmm there's 3 that i saw, 2 about the mouse? :S and one about tty0? [21:40] <scummos> can you paste them? [21:43] <regen> hmm, how does pastebinit work? [21:44] <KiltedPi> Into my laptop? [21:44] <scummos> KiltedPi: I'd say "NOTHING"
[21:49] <scummos> do you really not have a mousE? [21:50] <scummos> rikkib: it once didn't? [21:52] <ParkerR> regen, did you do the - after pastebinit? [21:53] <ParkerR> "strace -f ./FlyingCubes 2>&1 | pastebinit -"
[21:54] <rikkib> http://www.bencom.co.nz/cam/ Lets see how the cams hold up now. [22:02] <rikkib> Great bug fix from the kernel developers... Made the situation worse. [22:03] <gordonDrogon> treeherder, What ho! [22:06] <KiltedPi> and power supplies and cases! [22:08] <gordonDrogon> no idea..... ask them? [22:10] <treeherder> do i need to burn a bootloader? [22:11] <treeherder> lol, in general, wat2do now? [22:11] <gordonDrogon> almond I hope. [22:12] <gordonDrogon> You don't need to burn a bootloader - unless you want to use serial. [22:12] <gordonDrogon> you should be able to always download code via the SPI interface. [22:12] <gordonDrogon> or rather ICSP. [22:13] <gordonDrogon> I'll need to check. it's 6 months since I did that. hang on. [22:14] <gordonDrogon> yes. 8/ce0 goes to reset. [22:14] <gordonDrogon> note that the SPI driver must not be loaded. [22:19] <treeherder> sudo rmmod spi? [22:20] <gordonDrogon> _21h_, still there? How are you getting on? I've written a full program to set the clock from Linux and vice versa now. [22:20] <gordonDrogon> rmmod them both. [22:26] <gordonDrogon> Unfortunately I've seen a few others report this too. Do you have anything else connected to the pins - in particpur PB5 or pin 13 on the Arduino? [22:29] <gordonDrogon> I'm wondering if avrdude leaves the Pi pins in the wrong mode. [22:43] <rikkib> Hmmm new error. [23:14] <faLUCE> hi. I made an img of my sd card with dd if=/dev/sdx of=/path/to/image.img ... now, how can I see the content (directories, files etc.) of this img file? [23:15] <faLUCE> ParkerR: but I guesss I can mount it on a virtual device... how can I do? [23:21] <faLUCE> but, can I use an usb stick instead of a sd card? [23:21] <scummos> "please insert disk 741"
[23:26] <pksato> need to calculate some offsets.